​My story starts on Valentine’s Day 2014 when Martin proposed. We had a very comfortable 10 years together with lots of wine (me) & chocolate (Martin) along with other not very healthy goodies. We set the date for September 2015 as I wanted time to lose weight as I did not want to be a fat bride. Six months later and I had still not lost any weight and was getting desperate so I started looking into weight loss surgery. At this point Martin took his life in his hands and suggested that I give Les Slinn Personal Training a call. My best friend and Matron of Honour said she would come with me as she would like to lose some weight too. So after our initial consultation we were introduced to our trainer Richard. From the beginning, Jenny lost weight every week but she wasn’t so keen on the exercise. For me I struggled with the weight loss mostly because I couldn’t get my head around how much you could eat when making healthy choices, however I really enjoyed the training session every week with different new challenges and never doing the same thing twice kept me motivated. Jen lost 3 stone and then decided to give up. I carried on as by this time I could see results and Christmas 2015, I was 2 stone down and wanted to start running, a huge goal for me. Richard started to get me to do a bit of running at each session and the first time I did a mile was such an achievement - I was thrilled to bits and signed up for the Slinn Allstars Couch to 5k beginner’s course. It was at this point that Martin began to think he could do this too and he joined me on my weekly training sessions. Richard has been fantastic at challenging us both and the results have been amazing. Once upon a time my 3 yr old granddaughter ran away from me and I couldn’t catch her, now she is 13 and runs races with me. I have lost 5.5 stone and feel amazing. I love my weekly training sessions they are always challenging and varied. I have so much more energy and confidence than I used too. You don’t realise just how much being overweight stops you from doing the things you enjoy. I have the energy to play with the grandchildren and the confidence to take part in new experiences. 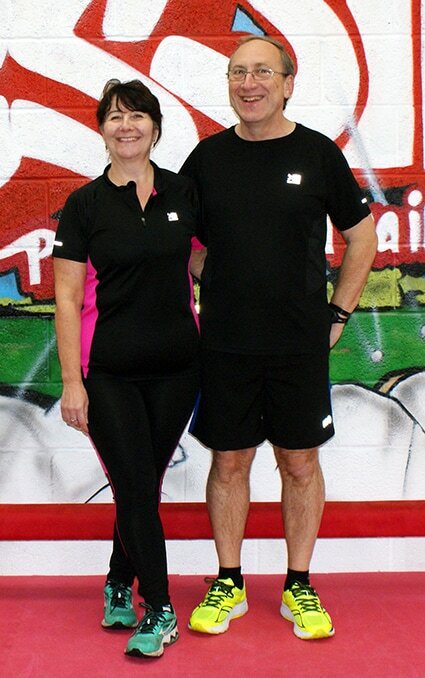 I can honestly say that if you are thinking of losing weight, wanting get fit then give the team at Les Slinn Personal Training a call and you will receive the best welcome from Les, Richard Alex and Adam. They will support, encourage and guide you to reach the goals that you want. I was 17.5 stone unfit and unhappy with the way I was. Now I am 11st 10lb a size 14 and feel amazing. Along the way Martin has lost 3 stone but he will tell you his own story. 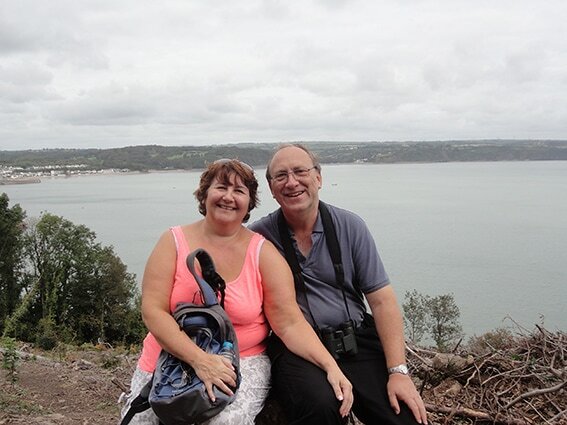 After proposing to Pauline in 2014, I also decided that it was time, at the age of 53, to lose some weight and get fit. At the time I was fast approaching 16 stone and apart from some gardening, I did little exercise so I started running on my own after downloading the NHS Couch to 5k programme. I found this quite hard to get motivated so I joined a local running group for beginners who helped me greatly to gradually build up my distance to run 5k. I signed up for the Saturday Parkrun at Lydiard Park and found my first run really hard especially on the final lap. However I had my first timed run at just over 31 mins and I was hooked. I started with Richard in January 2015 with the goal of losing some weight but also to improve my overall fitness as well as supporting Pauline. Over the next 2 years, I have lost nearly 3 stone and my overall fitness has improved. My Last Parkrun time was just over 25 minutes so I am now keen to break the 25 minute mark during 2017. Similarly my best for 10k has improved by 5 minutes and I can now run faster and further than at any time in my life. I have found the sessions challenging and hard work but the results speak for themselves. I still have a bit more weight to lose and I am slowly building up the distance I can run with the aim of running a half marathon during 2017.